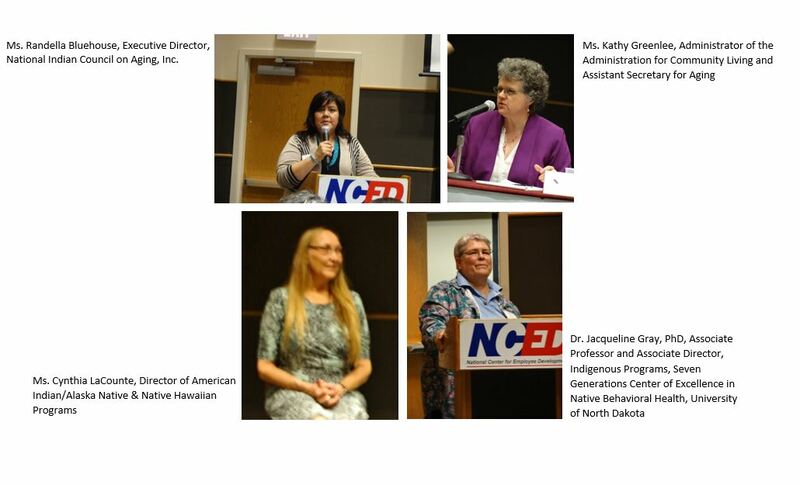 Albuquerque, NM, May 11, 2015 – With overwhelming and significant attendance, over 108 American Indian and Alaska Native (AI/AN) Elders, Tribal Leaders, Caregivers, and Service Providers from across the country convened in Norman Oklahoma on May 6, 2015. Although sudden threats of severe weather conditions loomed about the area the event took place with much success and accomplishment. This event held in conjunction with the Department of Health and Human Services Region VI & VII Tribal Consultation Session, started off with full vigor and excitement. The meeting room was filled to capacity with some attendees standing. 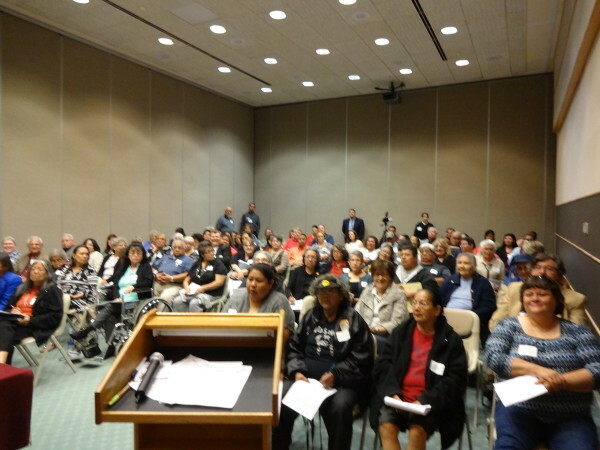 Attendees from thirty-one (31) Tribal Nations from the states of Arizona, Alaska, New Mexico, Oklahoma, and Washington traveled far and wide to voice their concerns about aging in Indian Country. 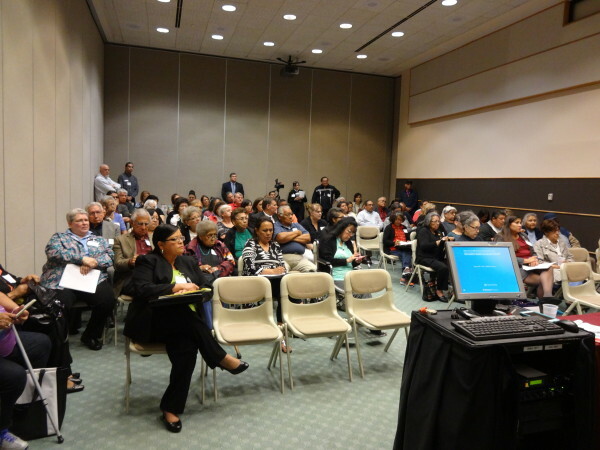 Assistant Secretary for Aging, Kathy Greenlee and Cynthia LaCounte, Director of American Indian/Alaska Native and Native Hawaiian Programs, were present to listen and to respond to issues and questions presented by the attendees. The session was scheduled from 2:00 PM – 6:00 PM but due to a severe tornado warnings in the vicinity of the event, attendees were required to move into shelter at the lower levels of the building. Assistant Secretary Greenlee and Director LaCounte graciously resumed the session after the threat had lifted and listened to every person presenting testimony until their conclusion at 8:00 PM. NICOA and our members were greatly honored to have our representatives from Washington, D.C. remain beyond the scheduled timeframe. The National Indian Council on Aging, Inc. (NICOA), in partnership with the Administration on Community Living (ACL) and the White House Conference on Aging (WHCOA) co-orchestrated this momentous event. 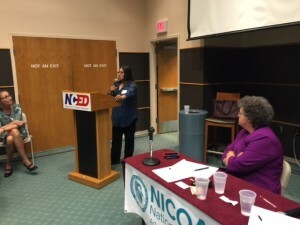 NICOA Executive Director Randella Bluehouse, concerned that aging issues of American Indian and Alaska Native Elders needed to be heard, advocated for this event. She attended the WHCOA Forum in Phoenix on March 31, 2015 and was disappointed with the lack of focus and inclusion of minority elders. She was most disappointed with the lack of discussion about aging in Indian Country. This motivated her to advocate for a listening session devoted solely to American Indian and Alaska Native Elders and stakeholders. NICOA is thankful to Nora Super, Director of the White House Conference on Aging for listening to NICOA’s request and sanctioning this event. This speaks to the issue of inclusion and her attempt to better understand cultural diversity and how it impacts aging in America. NICOA is grateful to the Oklahoma Indian Council on Aging for their participation and for volunteering to record the event. NICOA appreciates Julia Lothrop, Sr. Intergovernmental Affairs Specialist, Department of Health and Human Services Region VI & VII Tribal Consultation Session for providing the event space. Most importantly, the success of this event is due to the participation, thought provoking discussion and recommendations by the AI/AN Elders, Tribal Leaders, and Service Providers. The collective voices from Indian Country will help to improve the health, social services and economic wellbeing of American Indian and Alaska NativeElders across America.